Welcome to WJGA! 2019 marks the 43rd year of WJGA. When you have time, check out the alumni page where we show some of our alumni on various professional golf tours. Golf is a wonderful sport that will teach you many life values, give you a lifetime activity to enjoy and grow lasting friendships that you will always have. In this sport, there are times when you will face adversity. Impatience and frustration will be your challenge. At WJGA, we ask you to meet that challenge head on and resist the temptation to display anger in any way whatsoever. We expect our players to behave like respectful young ladies and gentlemen. Be a good sport in all ways, shake hands at the end of your tournaments, and always take care of the golf course replacing divots and raking bunkers, etc! It means so much to our volunteers to have a kind “thank you” as well. Enjoy your time with us, have fun and do your best!!! 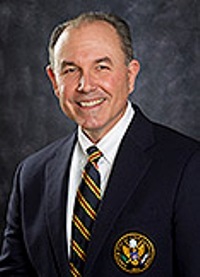 John Bodenhamer – won the WJGA State Championship in 1978. Now USGA Senior Managing Director of Rules, Competitions and equipment standards. Instrumental in getting the US Open at Chambers Bay in 2015.